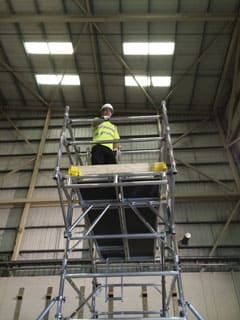 Every year, PASMA, as the trade body for the mobile access tower industry, attends a series of health and safety events to promote the latest best practise in tower use and training. This year has been no different, and has been busier than ever as PASMA’s international expansion has gathered momentum. In locations as varied as Birmingham, London, Johannesburg and Dubai, PASMA’s attendance this year has been anchored by a single recurring point – that one of the most vital things to consider when working at height on scaffold towers is the equipment being used. When it comes to towers, using the right equipment involves simply ensuring that the tower being used complies with one specific regulation – BS EN 1004. The European product standard focused entirely on towers, EN 1004 gives minimum requirements for the materials, dimensions, design loads, safety and performance requirements that the equipment should achieve if it is to be used. The simplest way for tower users to ensure they are meeting these minimum safety requirements is to look for the EN 1004 label, with which all compliant towers should be marked. When buying or hiring a tower, choosing the right supplier is one of the best ways to ensure the equipment received meets the standard – for example, all PASMA members who supply equipment are required to stock EN 1004 compliant towers. Aside from the markings, it is often easy to tell when a tower is non compliant simply by looking at it. EN 1004 towers have platforms which were purposely designed for that equipment type and have safe trapdoor entry and exit, built in access for safe ascent and descent, come with stabilisers of sufficient size and quantity to prevent overturning, and have guardrails at the correct gaps and dimensions to prevent a fall. By contrast, non-EN 1004 structures – sometimes referred to as ‘domestic’ or ‘H-frame’ towers – may have loose scaffold boards or DIY platforms which are unstable and lack trapdoors, lack built in access for ascent and descent, come without the required stabilisers, or contain gaps in their frames. These regularly dangerous structures – which in many cases need just a glance to establish that they should never be used – are surprisingly common. One reason put forward for their use is pricing, which is why PASMA is careful to note that rather than risk a life, hiring an EN 1004 compliant tower may often be both the safest and most cost effective solution. ‘Not on Your Life’ was first launched at The Health & Safety Event in Birmingham. Held on March 11, this marked the first time the campaign had been discussed publicly. Its first phase involved offering tower users a range of options, both physical and online, for finding information about safe tower use. At the launch event, PASMA’s Managing Director, Peter Bennett, said: “Dangerous work at height is far more common than it has to be, as using safe equipment can prevent many of the issues that repeatedly come up, such as not fitting proper platforms and guardrails. Simply using an EN 1004 tower can make all the difference when it comes to a site’s safety. To coincide with this launch, the association produced a new four page leaflet, ‘Choosing a Safe Mobile Tower’, which explains what to look for in a tower and how to use them. These were handed out to people in the industry along with Tower Safety Packs, which were given away at events and online. Hundreds of the packs were quickly sent out to people and companies who requested them, supplying them with information on the equipment and about how to hire, buy, own a tower and keep it in good condition, details on towers’ varied uses, and an explanation of the available training courses. At this time, a further point of information was created – the PASMA site’s ‘Scaffold Towers’ section, which consists of several pages and offers guidance about the issues surrounding towers. On the section’s main page, which shows two striking reasons to ensure work at height is safe, details of the number of people injured and killed by falls from height show that they accounted for almost a third of fatal injuries to workers in 2012/13, more than any other cause, and that those found guilty of health and safety offences were fined an average of around £10,000. Some cases received much larger fines. Other pages in the Scaffold Towers section offer the free Tower Safety Packs, explain both what the EN 1004 standard is and the critical safety features that compliant towers have, and provide links to further information. HSE statistics and links are provided, along with PASMA’s own information and guidance. Beyond these kinds of statistics and information, what has particularly helped the association to get the safety message out to end users is the frequency of stories about falls from these unsafe towers appearing in the media. PASMA has used some of these as case studies to illustrate the results of both using bad towers and using towers badly. Two of these case studies were promoted after the campaign’s launch at the health and safety event, as examples of falls which could have been prevented by the messages the Not on Your Life campaign has been promoting. The first of these examples involved Robert Wilkin, who was paralysed when he broke his back last year after falling from a second hand scaffold tower put up by an untrained builder. An EN 1004 tower could have easily prevented the structure being used in the unsafe way that led to the fall. Safe towers are designed to avoid anyone ever having to stand on an unprotected platform. Mr Wilkin said: “I don’t remember much about what happened after I fell. Lots of people were rushing about and it took the ambulance crew about 20 minutes to get me onto a back board because I had fallen in an awkward place between pallets of bricks. Paralysis is of course a common result of this type of accident. Even cases which do not lead to a fall can be shocking for the risks people are taking, however. PASMA’s second example of unsafe work at height came from a Merseyside construction site, which an HSE inspector happened to be passing last year. The inspector spotted a boy standing on scaffolding with his father, six metres up on a tower which, being non EN 1004 compliant, had wide open unprotected spaces which the man or his son could easily have fallen from. The tower was not fitted with proper platforms, built in access or guardrails. At one point the man had to help his ten year old son onto a too-short portable ladder above him by his ankles. Children should of course not even be allowed on safe towers, never mind one from which it would have been so easy to fall. Work at height is obviously for competent adult workers. The HSE inspector ordered the man to come down and help his son off the structure. Later the builder was fined, in addition to being sentenced with 80 hours of community service. This summer, at the Safety & Health Expo held in London on June 16-18, the campaign moved into its next stage. Using its first ever CoreSkills+ workshop at the IOSH Conference being held alongside the Expo, PASMA held a seminar devoted entirely to promoting the use of safe towers. He was joined in speaking at the seminar by a member of the Health & Safety Executive’s (HSE) Safety Unit. This seminar, which offered CPD (continuing professional development) points to attendees, helped take the campaign’s message to people within the industry. It kick-started the next phase of the campaign, which focused in particular on reaching end users. A major factor in PASMA creating the campaign was an HSE investigation which found that falls were a serious concern in domestic tower use. The campaign’s efforts to reach these users have been at the forefront of its promotion, and will be stepped up in the coming months as the online side of the campaign becomes its focus. A social media project, ‘Terrible Towers’, is set to be launched which will help expand Not on Your Life to engage the thousands of people who PASMA has reached through its social media in recent years. Based around crowd sourcing pictures – and inspired by how common it can be to see unsafe scaffold towers just by looking around – Terrible Towers asks people to take pictures of any towers they see and send them in to PASMA. They will then be given a mark out of 10 by the association’s technical experts and posted on the PASMA Facebook page with their mark. Terrible Towers is set to be officially launched and opened to the public soon, but even at this early stage a number of pictures have already been sent in by our members – some of them barely qualifying for any points. Work at height remains the biggest killer in the workplace, and a major source of injuries. As the provider of the industry standard training course, PASMA has used training to help deal with injuries from towers with increasing success every year, but ensuring that people are competent is only half of the battle. No one using a tower can ever be completely safe if the tower they are working on is not up to minimum standards. In promoting the use of safe towers, through this campaign and in the range of PASMA training courses, as well as emphasising the dangers of using equipment that does not meet these standards, the association intends to continue with the precedent it has set this year. Using its place as the voice of the mobile access tower industry, PASMA aims to continue to ensure that the risks posed by dangerous equipment are understood and minimised.